Caesar's Forum was the first of the five Imperial Fora to be built. It's located on the southern side of Via dei Fori Imperiali, just east of the back side of the Victor Emmanuel Monument, behind the statue of Julius Caesar. 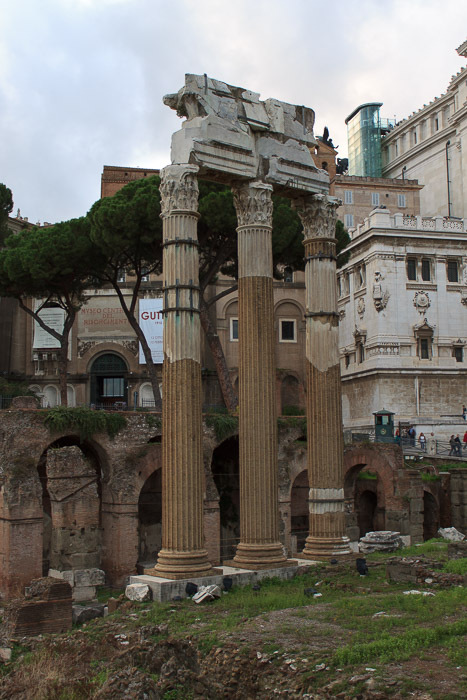 The most obvious relics in the forum are three tall brown and grey columns with corinthian capitals, joined at the top by an architrave (1st photo below). Those columns formed part of the side of the Temple of Venus Genetrix, a 8-pillar-wide by 8-pillar-deep temple dedicated to the goddess of motherhood. The depth of the temple was rather short compared to its width, but that was due to the lack of space. The rear of the temple was embedded into the bedrock of the Capitoline hillside. To the left of those three tall columns (when facing Caesar's Forum from Via dei Fori Imperiali) are two rows of 6 free-standing pillars, on a raised platform 3 steps up from ground level (2nd photo below). Pillars like those went around 3 sides of Caesar's Forum, surrounding the open plaza in the center. Along the back edge and the right corner of the 2nd photo below, the wall with arches is called the Basilica Argentaria, which was erected under Trajan to adapt the slopes of the Capitoline Hill after the removal of the saddle between it and the Quirinal Hill to make a flat area for Trajan's Forum. Since the basilica was built in a predetermined space it has an irregular shape. It probably continues out of the present archaelogical area under Via dei Fori Imperiali. The plaster covering of the back wall of the building, still preserved, displays some graffiti from Roman times. The side of Caesar's Forum was built against the Capitoline Hill, and because of the odd shape of this boundary there was space to create the rooms shown in the 2nd photo below. Several of those rooms had a second story which opened onto the Capitoline Hill. See all Caesar's Forum photos. In the 1st photo below, taken from the eastern end of Caesar's Forum, you can see the Temple of Venus Genetrix in the distance, with the Victor Emmanuel Monument in the background, and the pillars of the left side of Caesar's Forum near the center. Behind the pillars is the Basilica Argentaria. Back in the day, those pillars would have continued running off the left edge of that 1st photo below into the foreground, then crossed the image right in front of my camera, then run along the right edge of the image back toward the Temple of Venus Genetrix, enclosing the forum. 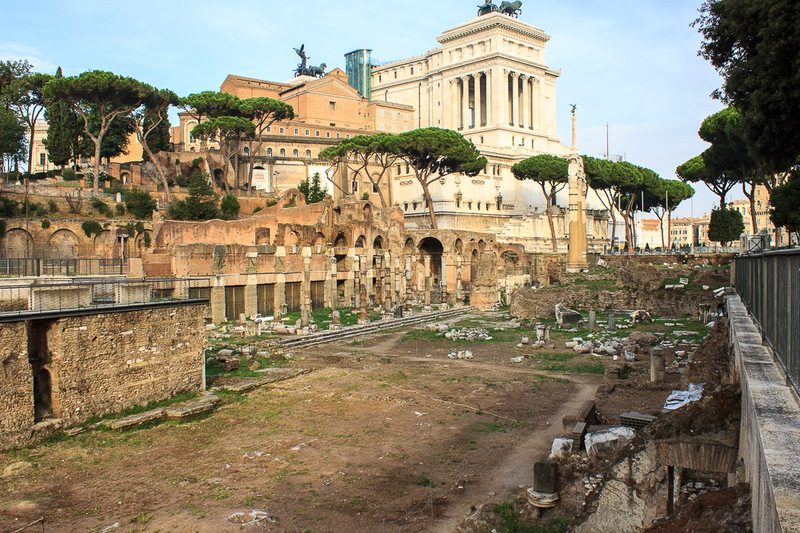 The eastern end of Caesar's Forum was lined up with the eastern end of the Curia in the Roman Forum, that brown brick cube of a building further away from the street. Senators could exit out the back doors of the Curia end end up right in Caesar's Forum - how convenient for Caesar's propaganda purposes. This 1st photo below also gives a good idea of the difference between ground level in ancient times versus now. Today's ground level is at the top of the retaining wall on the right edge. Ground level for Caesar was about 15 or 20 feet down. 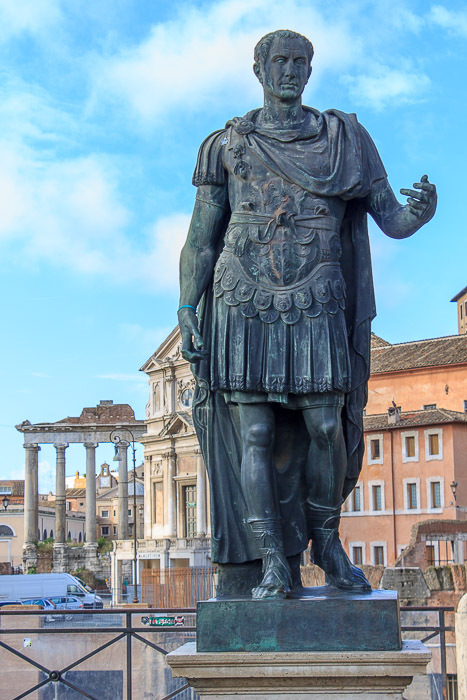 Floods from the Tiber River, erosion from the hills, and garbage from the inhabitants have all contributed to raise the ground level of Rome by an average of 20 feet above Caesar's cold footprints. The statue of Caesar on the right is located on Via dei Fori Imperiali, right in front of Caesar's Forum. See all Julius Caesar photos. Caesar's Forum was planned before 54 BC, because that was when, while fighting battles in Gaul, Caesar asked Attico to purchase the land. This purchase was made, and the edge of the Capitoline Hill was modified to make a large enough flat area. The forum was funded with wealth obtained (stolen) by Caesar during the Gallic Wars. Caesar vowed, on the night before the Battle of Pharsalus in 48 BC during his civil war against Pompey, that a temple would be built in the forum to win over Pompey's favorite goddess, Venus Vicitrix (love conquers all), but after victory was obtained over Pompey and the good graces of that goddess were no longer required, he actually dedicated the temple to Venus Genetrix (universal mother), the mother of Aeneas, from which Julius Caesar's family (and thus all emperors from Augustus through Nero) claimed descent. A statue of Caesar himself riding Bucephalus, the celebrated horse of Alexander the Great, was placed in front of the temple, to symbolise absolute power. The temple contained several important works of art, including a statue of Venus, a gilded statue of Caesar's Egyptian lover, Queen Cleopatra, valuable antique paintings, collections of engraved gems, and a corselet of British pearls, among other objects. Yes, a guilded statue of Cleopatra! Imagine what Caesar's wife Calpurnia, the first lady of the Roman Empire, thought of this exhorbitantly-expensive and prominently-placed statue of her husband's lover. She lived just a few hundred meters away in the small Domus Publica and must have visited the Temple of Venus Genetrix at least a few times, while Cleopatra lived in Caesar's huge villa across the Tiber (the Horti Caesaris, where Cleopatra was living at the time of Caesar's assassination, along with her and Caesar's son, Caesarion). I wonder which of those two ladies Caesar would pick up during the evening to go for a ride in a litter over to the temple to admire the statues? One day, between when Caesar had appointed himself dictator for life and when he was assassinated, while he was sitting in this Temple of Venus Genetrix he was approached by a group of senators. The dictator refused to stand to greet them. The senators were insulted and felt this was proof that Caesar thought of himself as royalty now. In reality, though, Caesar just suffered from diarrhea and couldn't stand up because he was afraid he'd soil himself if he did. The senators took this evidence as one of their justifications for assassinating him shortly thereafter. 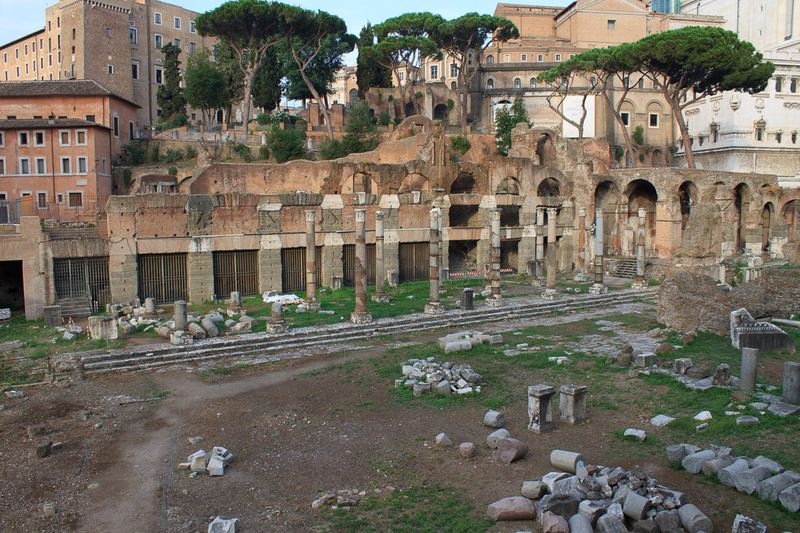 The forum was dedicated in 46 BC, while construction was still ongoing. It was finally completed by Augustus sometime after Caesar's assassination in either 44 or 29 BC. The fire of 80 AD destroyed Caesar's Forum, and it was rebuilt in 95 AD. Trajan reconstructed the Temple of Venus Genetrix in 113 AD. 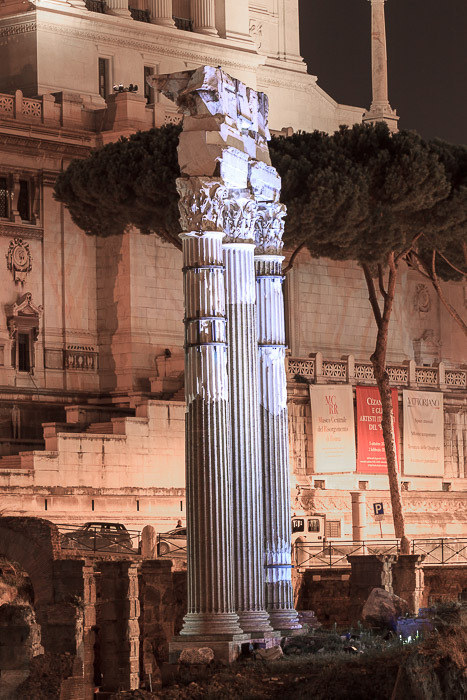 1800 years later, during the 1930s, the forum was uncovered during excavations of millenia of accumulated dirt in order to build the Via dei Fori Imperiali, and the three columns of the Temple of Venus Genetrix were reconstructed. Other relics from Caesar's Forum, some found during this excavation, are on display in the Museum of Imperial Fora. 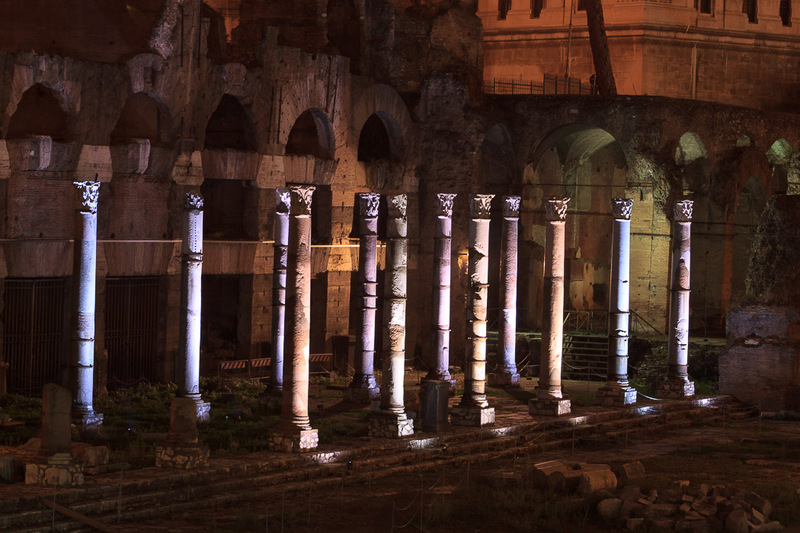 Be sure to come back here at night to see the Forum, and the other Imperial Fora, lit up beautifully (two photos below). Also, be sure to walk up the street at the end of the forum, just past the 3 tall columns. Near the top of the hill you can head to the right to get to the Campidoglio (Capitoline Hill), or you can branch to the left to get a spectacular view of the Roman Forum all lit up at night. This view is one of the don't-miss sights of Rome.